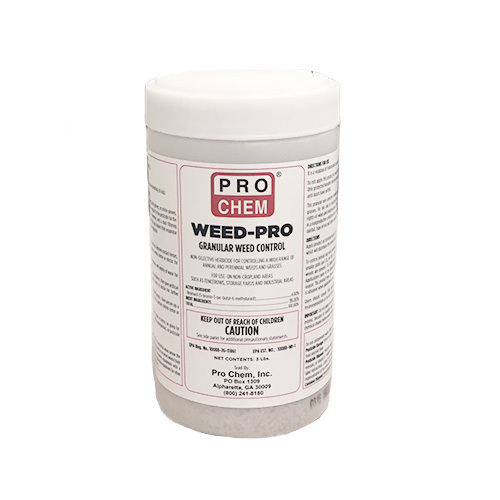 WEED-PRO | Pro Chem, Inc.
WEED-PRO is a non-selective herbicide that is used for controlling a wide range of annual and perennial weeds and grasses. The active ingredient for this product is Bromacil, which works its way into the soil and into a plant’s root system. It kills the pants by interfering with photosynthesis. Typically one application will work for up to one growing season. Eventually the Bromacil will leach below the root system (this can happen faster with higher than normal levels of precipitation). 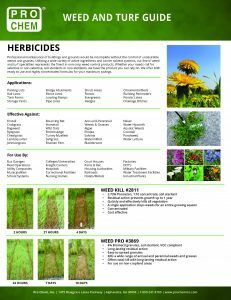 Once below the root level, the herbicide will no longer be effective. Using more than recommended will not make this product last longer because it will leach at the same rate as lower amounts. This granular weed killer is recommended for non-cropland areas away from residential/recreational areas and desired woods, brush and foliage. Apply product as furnished using a seed spreader, fertilizer spreader, shaker type applicator or any equipment which will distribute this product over the area to be treated. To control annual and most perennial weeds and grasses, apply at a rate of 200 to 300 pounds per acre. On smaller plots, use 1 pound per 150 to 215 ft2. Repeat spot treatment may be required when deep-rooted perennial weeds are present. To obtain best results, apply to the ground where it will be absorbed by the roots. Applications early in the season have been found to give results superior to applications made later in the season. This product may, however, be applied at any time of the year. Maximum effectiveness in arid regions is obtained when application is made just prior to the rainy season. Precaution: Not for use in recreational or residential areas.